Friends, this post probably should not be titled ‘Office Reveal,’ because it’s a bit more than that. 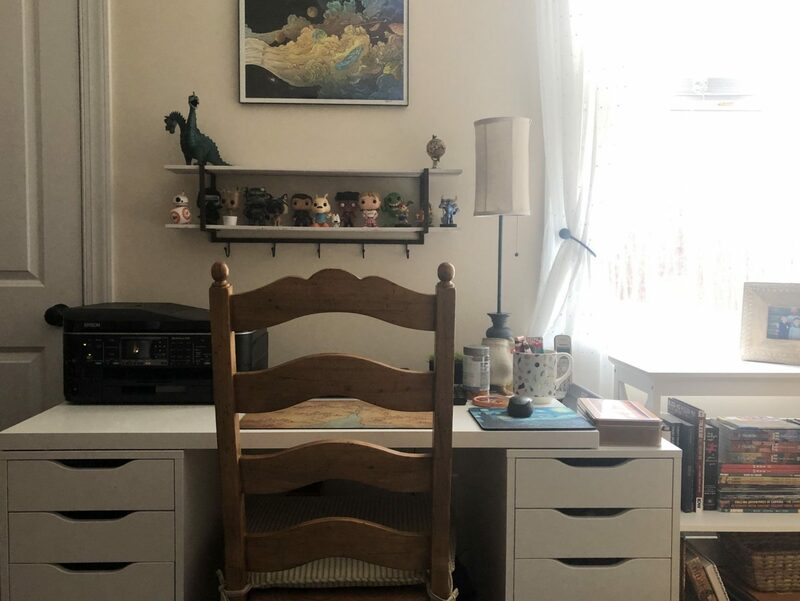 This is more of an office/guest room/craft room reveal, because our 5th bedroom is exactly all of those things. When we were having our house built, we were so, so excited to have a designated guest room/office. The thing that’s been so frustrating about it since day 1 of moving in is this is the ‘dumping ground’ room. Anything and everything that didn’t have a home somehow landed here eventually. 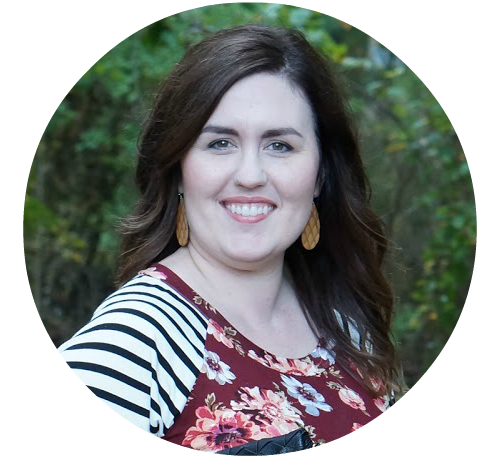 And with that, I hope to give you some office and guest room inspiration. This room is not 100% done, because the closet is still a ‘dumping ground.’ That, my friends, is another project for another month. So, I’d like to start this reveal off by saying, this room might not be everyone’s style. It is a very, very comfortable room for my husband and I to work or relax in the evening. We are so, so happy with it. 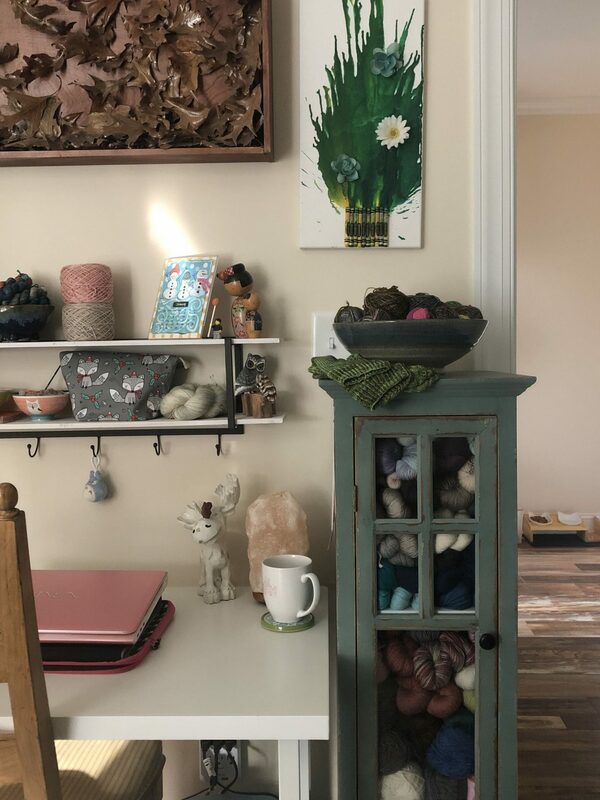 If you already know I’d been planning to decorate room by room, you probably remember that I had started with the kitchen/dining room and move on into the foyer. This room was not in the plans for the foreseeable future, until I came across this single blue cabinet in Kirkland’s. This blue cabinet (the double version is on the other side of the room, and you can see that once you scroll down) was a figurative snowball. It jump started this whole decorating process. 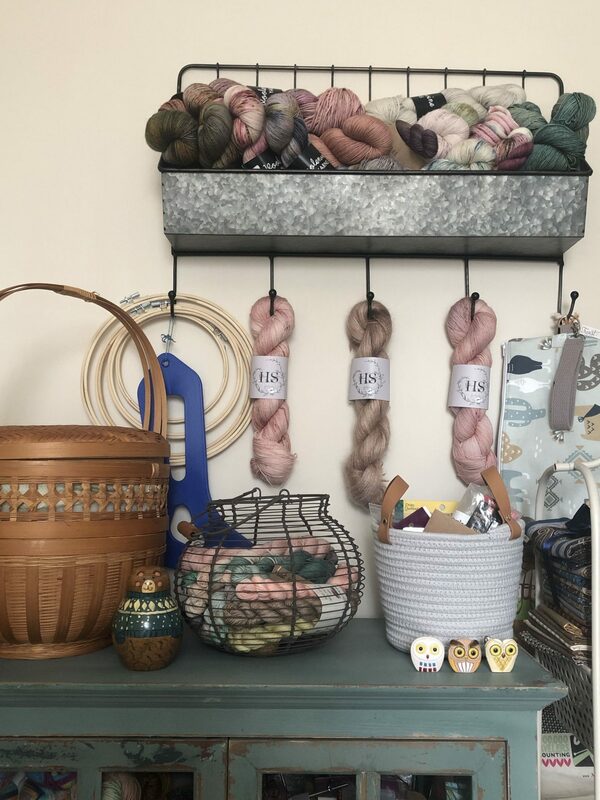 So, I purchased it and started storing (some) of my yarn in it. If you don’t already know, I am a knitter and I hoard yarn. 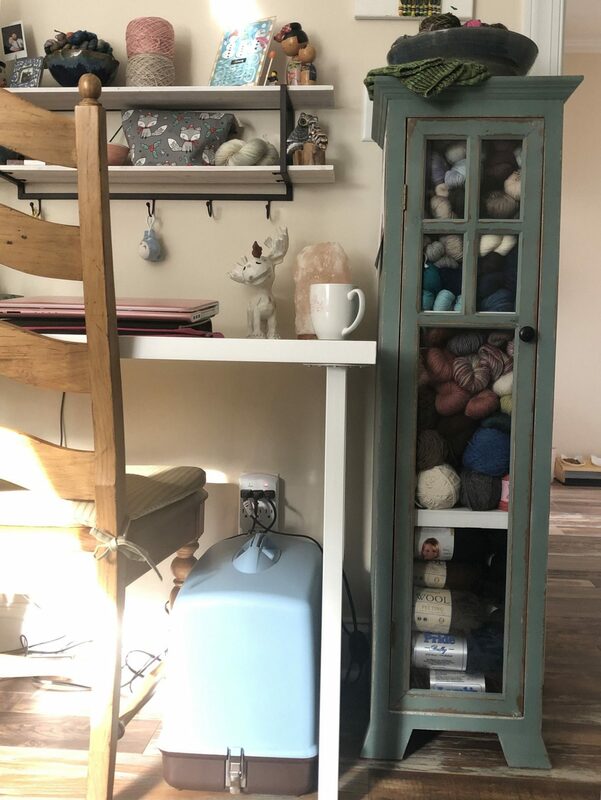 I quickly realized that this one, single cabinet was not enough for all of my yarn. So, I started looking for something that matched, which is when I came across the double version. Well, that got me started measuring the walls and rearranging everything … and two months later, this is what we have! 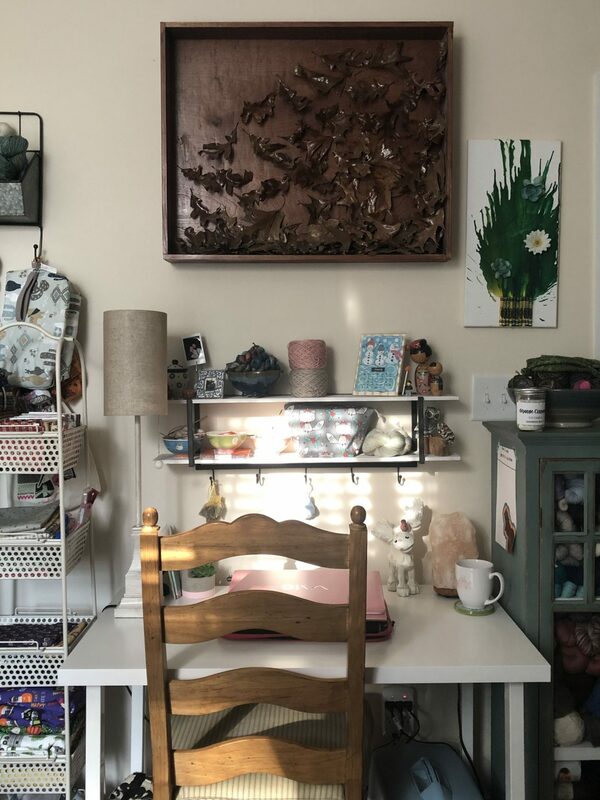 Here you can see, I am able to store my sewing machine below my table. It’s so easy to access it now. Both of our chairs actually come from our dining room. We have a total of 10 chairs but only need 6 most of the time. Two more are next to the china cabinet in the dining room, and these two had previously lived in the store closet under the stairs. They are very, very comfy so I’m glad to have a spot for them now that’s also useful. The contents of my shelf are always changing. I have yarn for current and future projects, yarn that’s just pretty, and a bowl of mini skeins. My laptop stays on the desk, since this is where I blog as well. 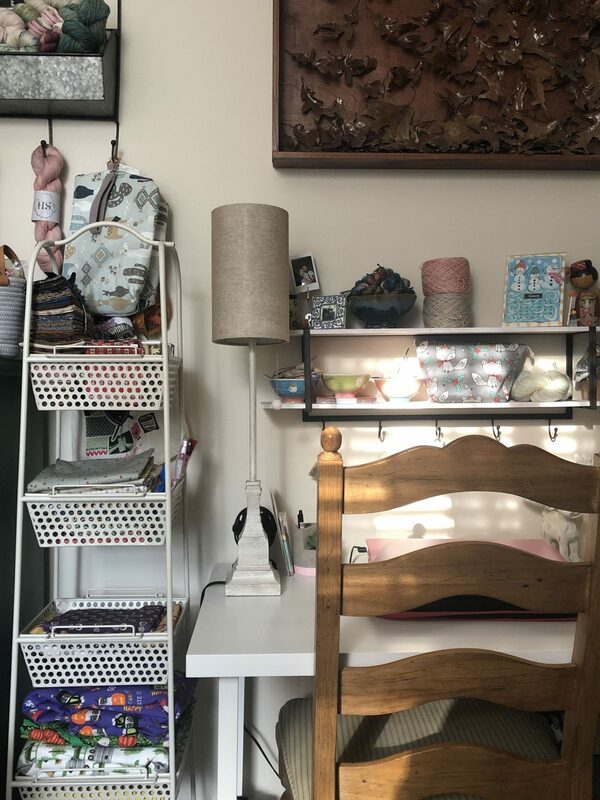 To the left of my table, I store all of my fabric in this basket tower. I have a few notions in the bottom basket as well. Next to my fabric, I have the double version of the other blue cabinet. I still can’t believe how perfectly everything fits along this wall. It really worked out well. Everything is close enough that I can get to it easily, but I don’t feel overly crowded as well. 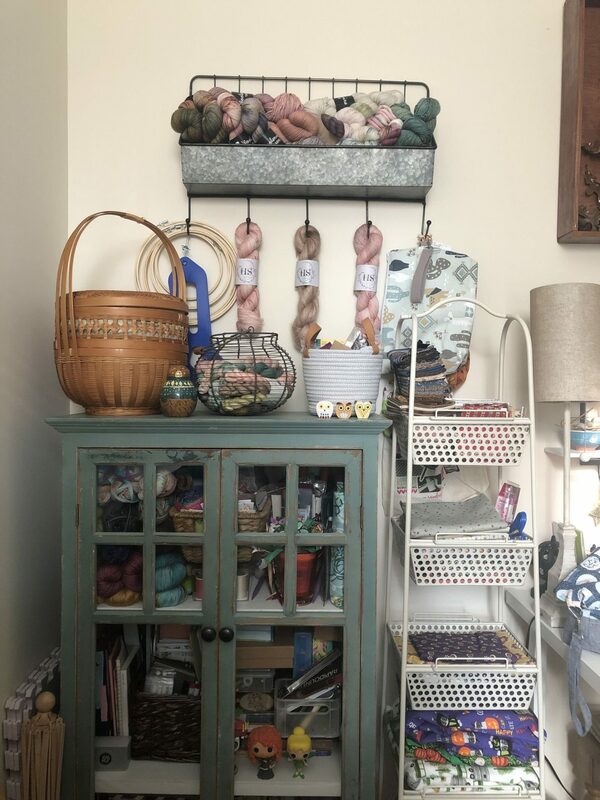 This double cabinet sores the rest of my yarn, knitting notions, knitting needles, all of my paper craft notions, my drawing pens and pencils, paper, and all my knitting and raft books. 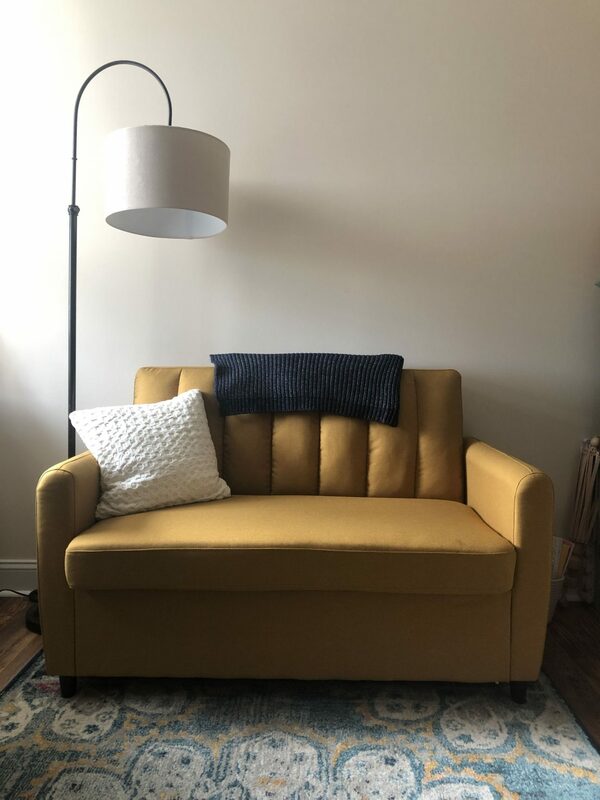 Now, for one of my favorite pieces of the whole room, the sleeper loveseat. We had quite a few requirements for this. It had to be less wide than the rug and not too deep, and it needed to be a sleeper for a guest. This pulls out to a twin bed that is surprisingly comfy! And, of course, I love the mustard color. I picked up two of these baskets. 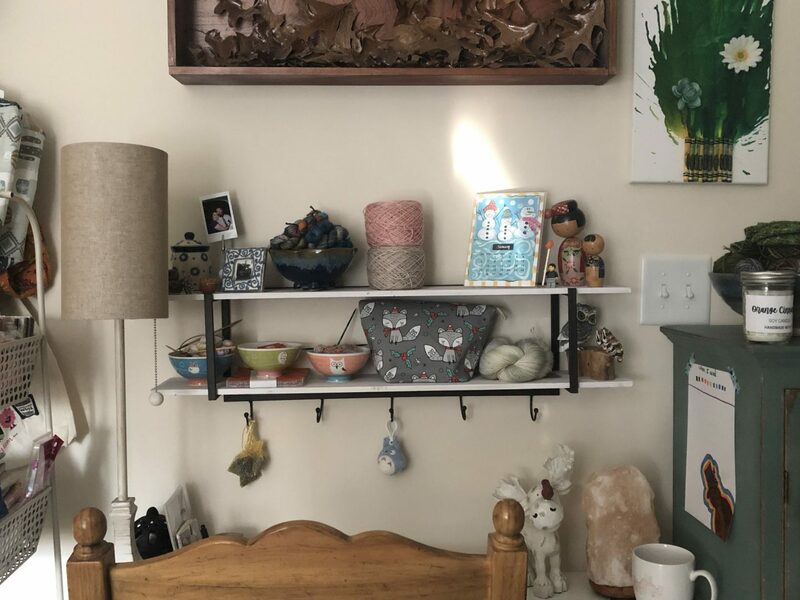 You might have noticed the same basket on top of the double cabinet. 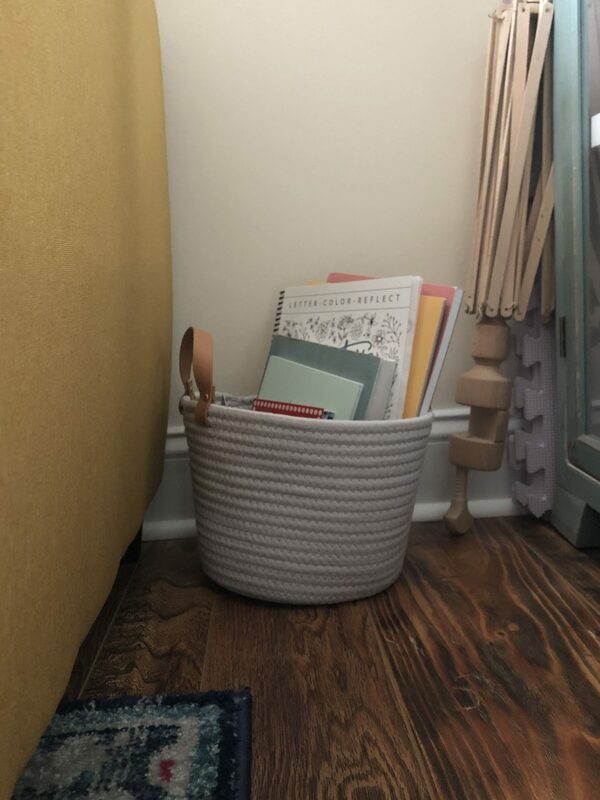 This larger basket stores all of my hand lettering supplies. Since it’s out where I can see it, I am reminded to work on it every day. 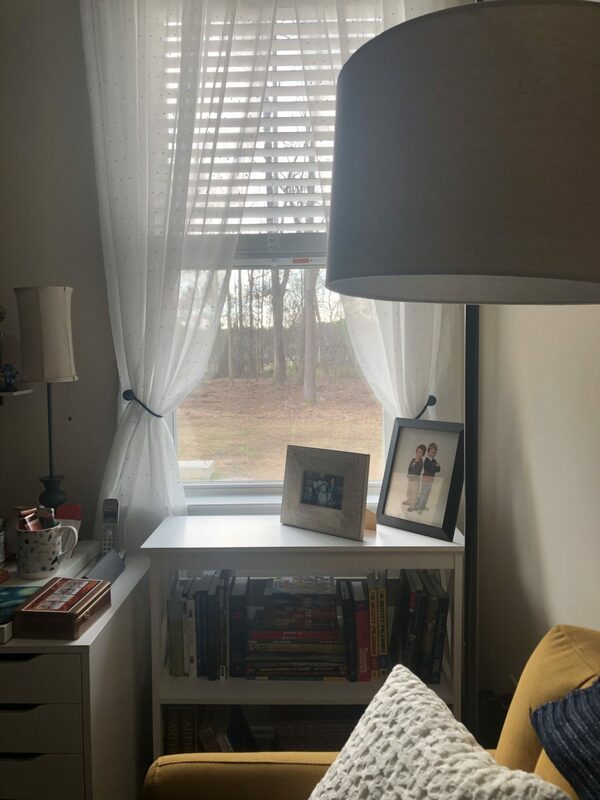 Spinning around to the other side of the room, We have a window with a small etagere bookcase below it. 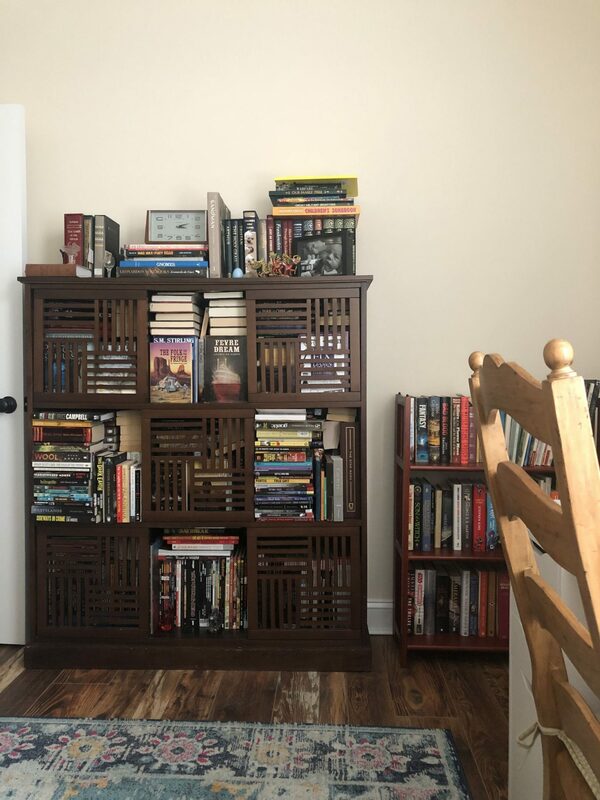 This houses my books, and the rest of my books are in a different room. This will serve as a nightstand, and I plan to add a clock in the future. 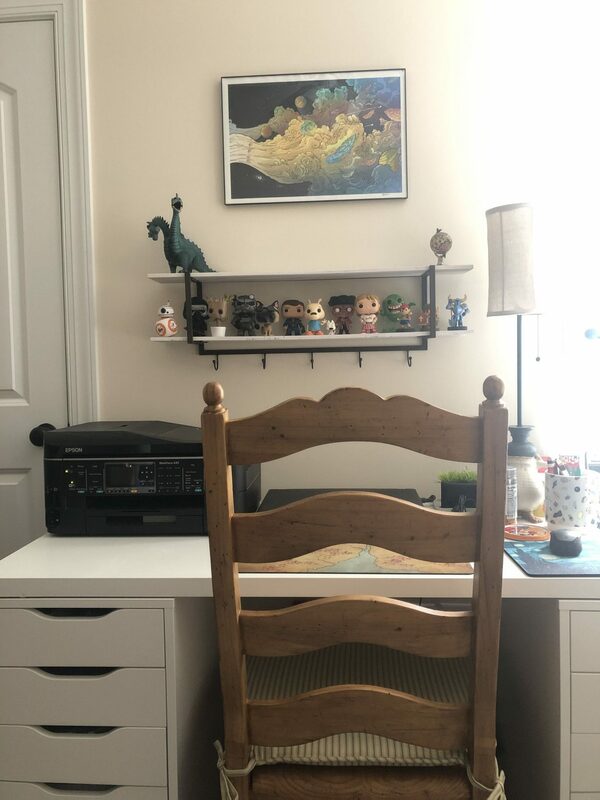 On my husband’s side of the room, he has another IKEA Linnmon table top on top of two Alex drawers with file drop. Basically, the fourth drawer is a large file drawer! I had never seen these Alex drawers before, but they were exactly what we needed. He also has the same chair and the same white washed shelf as me. It’s been working out really well! Spinning around once more, we have two book cases. These ar emy husband’s books. This really cool bookcase came from Pier 1, and we bought it over 12 years ago after we got married. It’s the only thing left from the original furniture in this room. We plan on hanging some artwork on this wall, which will really pull it all together. 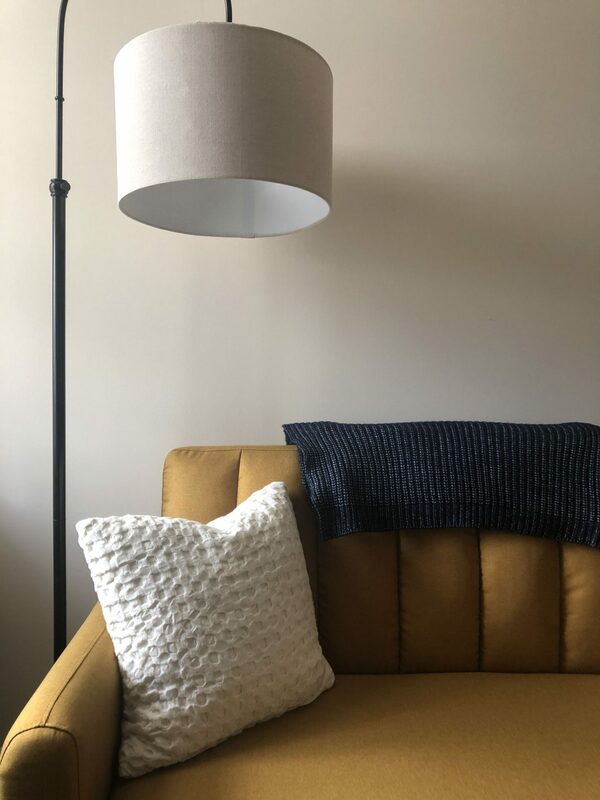 I hope you enjoyed this and got some office and guest room inspiration!